The Bladez Fitness Echelon GS Indoor Cycle is a bike that comes with what look like to be very good features and all at a good price too. With a heavy flywheel, fully adjustable, belt drive and a console it certainly has the right characteristics for providing the basis for good cardio workouts to keep you fit and help weight loss if you want. When looking at bikes in this price range it can sometimes be “that you pay for what you get.” Although you’re not paying top dollar for the bike you do want to be sure that it is something that will last and can cope with intense cardio at the level you want. In this review we look at what you get for the money and how this measures up as a piece of cardio equipment for the home and whether you are ultimately left disappointed with an expensive clothes rack. 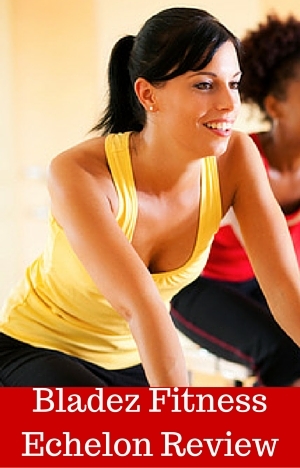 Training at home is a convenient and economical way to meet fitness goals. The equipment needs to be reliable and easy to use. The bike has an oversized steel frame for strength and stability. It will keep you steady when you are working out at a moderate pace or with more intense workouts. There is no wobbling when you are in the saddle or out and when transitioning in between. The bike has a 40 lbs flywheel which pulls the pedals through the cycle stroke to help giving the feel of a natural riding motion. The wheel will help in keeping your stroke fluid and not choppy which can be hard on the joints as happens with lighter flywheels. There is no guard over the flywheel or the resistance so they need to be cleaned down to prevent damage from sweat dropping on them – it will start corroding and gumming up the works if the cleaning isn’t done regularly. If the floor has some unevenness there are levelers under the stabilizer bars that can be turned to level out the bike to stop any side to side rocking. The handlebars and seat can both be adjusted vertically and horizontally giving you the flexibility needed to get the bike to fit you and others comfortably and properly for the best riding position for workouts. There are pre-set holes in the adjustment poles that you use for holding the seat and handlebars once you’ve positioned them. You tighten them in place with the adjustment knobs, This does restrict you a little as you need to put them to the nearest hole rather than the exact position you want. It can sometimes feel that you are little too cramped or stretching a little. he advantage is that with the pre-set holes and the pin that is inserted with the adjustment knobs is that the seat or handlebars won’t slip as you ride as they have the added safety of the pin. The bike should fit people between 5 ft and 6ft 2 ins but this does depend on leg length and if you are close to either of these limits it is worth trying the bike out before buying. Making the adjustments is quick and simple so it can be used by multiple people without really slowing down the start of the workout. It is something a whole family can used for those in the range of heights. The bike uses a felt pad that sits on top of the flywheel to provide the resistance needed for hill climb and tougher workouts. You turn the adjustment knob at the top of the frame and this adjusts the resistance. It is incremental and is constant. The pad provides a consistent amount of resistance so the flywheel doesn’t slip as you pedal. It can take a little time to work out how much you need to adjust to get the resistance but it doesn’t go from easy to tough in just a small turn of the knob. There are no markings on the resistance to provide guidance in determining where to set the resistance level at but this is usual for spin bikes. Only more expensive bikes with magnetic resistance offer this guidance 9as a rule). It takes a little experimenting to get this right but this is to be expected for a spin bike. The pad does wear down over time and need replacing. Replacement pads are available from the supplier. The drive is a belt drive which makes for quiet and low maintenance rides. It does give a smoother ride than you get with a chain so you do lose some of the bike feel. There is no adjusting or lubrication needed on an ongoing basis. But it will need replacing after a few years as it will stretch and eventually start slipping. At this stage you are going to need some with specialist skills and tools to replace it. The bike has a fixed gear that allows the flywheel to put the pedals through with the inertia it builds up. When the flywheel is turning so are the pedals which gives the rolling down the road feel and promotes a full pedal stroke. It does mean that you need to apply the brake or push back gently with your feet to stop the pedals from turning so that you can get off the bike safely or if you want some time to recover between sprints. The pedals have toe cages with straps for use with athletic shoes. You slide your shoes in to the cages and then tighten the strap to hold them in place while you ride the bike in the seat or out. The Q Factor of the bike 8.3″ which is wide . This is a measure of the distance between the horizontal distance between the pedals. Your feet are going to be further apart than your hips as you pedal which is not going to feel natural and this can put additional strain on your joints and can increase the risk of injury for some people. As a general rule the narrower the Q Factor the more natural and more alignment. To get bikes with a Q factor similar to an outdoor bike are the Spinner Sprint but it doesn’t have a belt drive although it is reasonably quiet. Noise. The bike is quiet with the only real noise coming from the felt resistance pad rubbing on the flywheel being the loudest noise. You are unlikely to disturb anyone while you workout and you can hear the TV without turning the volume up too much at all. Seat. It has a standard bike seat which you may find uncomfortable. You can do the same things you’d do on a bike if you do find it hard on your sit bones – you can try padded bike shorts, a get seat cover or replace the seat with another standard fitting wider bike seat. Handlebars. The handlebars are coated to provide a good grip especially when hands are sweaty. You can grip the bar in the standard spinning hand grips as well as lean in the short aero bars in the middle. There is no padding on the bars so you may find your arms getting sore if you lean on them for long periods. Dust and Dirt. The bike does give off some dust from the resistance pad and a little lubricant but it is a fairly clean bike. The biggest issue is likely to be sweat and that needs to be cleaned from the bike to prevent it corroding the bike even though it is painted the salt will eventually get through it. To prevent damage to your floor a rubber mat is advisable. There are 2 transport wheels on the front stabilizer bar that you tip the bike onto when you want to move it. They support most of the weight so you can just wheel it to where you want it to go. One person can do this but you do need to be careful with it. The wheels work well on hard surfaces but struggle on soft surfaces and carpets with a deeper pile. They may cause damage to softer wooden floors – it makes sense to test them before moving it across the floor. The bike does need some assembly when it is delivered. This is normal for spin bikes to be delivered part-completed. To complete the assembly normally takes between 30 – 60 minutes. There are only a few parts that need to be added making it a relatively straightforward job. The instructions cover the process well and the tools needed are included with the bike. You are required to add the stabilizer bars, pedals, adjustment poles, water bottle holder, console, seat and handlebars. The most difficult part is likely to be handling the bike due to its weight of 100 lbs, when moving to where you want to assemble it and putting on the stabilizer bars. It is advisable for there to be 2 people involved to hold and move the bike. It is great the bike has console as most bikes in this price range and even more expensive ones don’t have anything at all. It is basic and small but the screen can be seen while you ride. You are only able to see one metric at a time which can be annoying. It is possible to set it to scan through them with the metric displayed changing every few seconds. The console measures time, speed, distance, total accumulated distance and calories. They are all estimates from time elapsed but are useful for comparing workouts rather than as using as absolutes. It is situated in the middle of the handlebars for easy access and reading. The console turns on if any of the buttons are pressed or you start pedaling. If you stop pedaling or don’t push any buttons for 4 minutes it turns off and resets. Four minutes is a reasonable amount of time if you need to stop to do something in the middle of a workout. It doesn’t record your workout data or allow you to update to a fitness account or program so if you want that you need ot record manually in a workout journal. The console requires 1 AAA battery. You’ll know when the battery needs replacing because the screen doesn’t work properly. As with all but a very few spin bikes this bike doesn’t have much in the way of accessories. The only accessory it has is a water bottle holder that is on the right fork near the flywheel. It’s positioning is okay but you may need to bend a little to get to it. It is a metal holder you slide the bottle in and out of. It’s been designed to make it easy to slide the bottle into, so it shouldn’t mean you slowing your ride too much to get the bottle in there. There are some general guidelines in the manual about exercising, stretching and safety. There is nothing specific on how to use the bike, set it up or suggested workouts. This would be good information for a beginner to have. Fortunately, you can get this information from the internet and YouTube. The reviews overall are positive for the bike. The negative one left is more about how it compares with a previous higher end bike than the bike itself. You can get better bikes if you pay more but it does depend what you want from the bike. The other customers in their reviews says they are happy with the feel of the bike and it’s quality; low noise and sturdiness especially considering the price with only the seat and console coming in for criticism. This is an affordably priced bike especially for one with a belt drive, a console and good customer ratings. The only other affordable bike with a belt drive is the Sunny Health & Fitness Indoor Cycle Trainer – 49 lb. Flywheel that comes with a 49lbs flywheel (as the name suggests) but the handlebars can’t be adjusted horizontally and doesn’t come with a computer. It is also highly rated and is about $50 less expensive at time writing. Check out our review here. It qualified for free shipping on Amazon when I checked. This good bike made for beginners and those wanting moderate training rather than those who take their spinning and indoor training very serious – although it can provide intense workouts too as it is well put together for the price. It is a sturdy bike that doesn’t rock when working out so you can just get on with your workouts. The flywheel produces a good pull through of the pedals for a fluid riding motion for a good pedal stroke that provides a low impact pedal stroke. The ability to quickly adjust the bike means it can be used by all the family. It would be great if it had a better console but that would probably increase the price. What you do get is a good basic bike that is good for all but those who are wanting a top range spin bike for some very serious training and workouts. It is ideal for beginners and those wanting moderate to more intense workouts.